Big news in the crypto scene this week was that the MyEtherWallet DNS Hack that occured managed to collect about $17 Million USD worth of Ethereum in just a few hours. The hack itself could have been MUCH bigger as it actually involved compromising 1300 Amazon AWS Route 53 DNS IP addresses, fortunately though only MEW was targetted resulting in the damage being contained in the cryptosphere (as far as we know anyway). 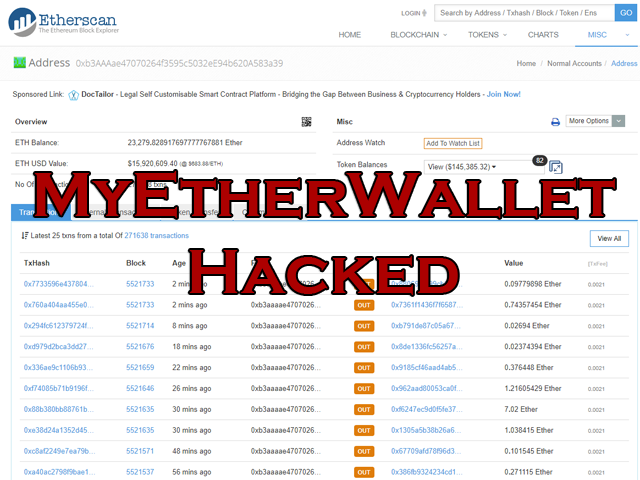 Read the rest of MyEtherWallet DNS Hack Causes 17 Million USD User Loss now! Only available at Darknet. The Multi-State Information Sharing & Analysis Center (MS-ISAC) has released an advisory on multiple Hypertext Preprocessor (PHP) vulnerabilities. An attacker could exploit one of these vulnerabilities to take control of an affected system. NCCIC encourages users and administrators to review MS-ISAC Advisory 2018-046 and the PHP Downloads page and apply the necessary updates. NCCIC encourages users and administrators to review Drupal's Security Advisory and apply the necessary updates. The campaign is extremely complicated, leveraging a number of implants to steal information from infected systems and is intricately designed to evade detection and deceive forensic investigators. The implants vary considerably and although they share some functionality and code, they are categorized as different families. As McAfee Advanced Threat Research analysts investigated this campaign, we recognized many similarities to indicators used in the 2014 Sony Pictures attack. A portion of this campaign aimed at the Turkish financial sector using the Bankshot implant was recently discovered by McAfee Advanced Threat Research analysts. This appears to have been the initial stage of Operation GhostSecret, as within days of publication, new attacks appeared beyond the financial sector. Between March 14 and 18, we observed the data reconnaissance implant in organizations across 17 countries. Delving further into this campaign reveals a narrow list of organizations across the globe; the threat actors have been explicit about who can connect from which IP address. Reviewing the WHOIS information for these IP addresses shows us that there is some correlation in geography, although there are no additional clues why these addresses were used. As we monitor this campaign, it is clear that the publicity associated with the (we assume) first phase of this campaign did nothing to slow the attacks. The threat actors not only continued but also increased the scope of the attack, both in types of targets and in the tools they used. We try to avoid using the word sophisticated because it is both subjective and overused. Nonetheless, the attackers have significant capabilities, demonstrated by their tools development and the pace at which they operate. Fighting cybercrime is a global effort best undertaken through effective partnerships between the public and private sectors. McAfee is working with Thai government authorities to take down the control server infrastructure of Operation GhostSecret, while preserving the systems involved for further analysis by law enforcement authorities. By creating and maintaining partnerships with worldwide law enforcement, McAfee demonstrates that we are stronger together. The post Global Malware Campaign Pilfers Data from Critical Infrastructure, Entertainment, Finance, Health Care, and Other Industries appeared first on McAfee Blogs.